We’re extremely proud to once again be included in the Gartner Magic Quadrant for Operational Database Management Systems. Reading through their summary of EnterpriseDB and EDB Postgres, a few things in particular stood out to me. First, it was great to once again see the recognition of EnterpriseDB alongside the giants in the database industry. This is our 6th consecutive year in the Gartner Magic Quadrant for OPDBMS, which is every year since this MQ was introduced in 2013. We continue to be the only open-source based RDBMS company in the rankings. I find this especially impressive when you consider the other RDBMS vendors in the group are companies that operate at enormous scale such as Oracle, Microsoft, and Amazon Web Services (AWS). Second, an area in which we made tremendous progress in over the past year is in the strength of our ecosystem. This is reflected in a couple of ways. In the context of the Postgres community, we continue to contribute a large part of our engineering effort to the open source PostgreSQL project, being the leading contributor there. This stands in stark contrast to some vendors who derive significant commercial benefits from PostgreSQL while giving very little back. Outside of the open source community, our ecosystem is also developing rapidly with robust and expanded partnerships with Alibaba, HPE and IBM among others. We also built on some of our technology partnerships with companies like Quest, Pivotal and Red Hat to make it easier to use EDB Postgres in conjunction with tools from those companies. Third, the report referenced our strong performance on customer satisfaction. This one is probably the one that makes me the happiest. If we can’t make customers happy and successful, we’re just not doing our job. 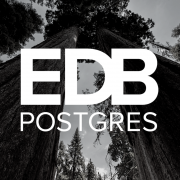 We know that Postgres is one of the most loved databases out there and it’s great to see that our customers are also happy with EDB’s efforts to support them in their use of this well loved DBMS. We invested heavily in our customer success program in the past year, and our commitment to continuous improvement is reflected in what our customers had to say about us to Gartner. Like our CEO Ed Boyajian said, “Postgres continues to crush it in the market!” It has taken the work of many to make that a reality, including the dedication of the PostgreSQL community, the enthusiasm of Postgres users, and the innovation of organizations that apply Postgres to modern business use cases. As one of the companies working as part of that community, we’re once again extremely honored to be recognized in the Gartner Magic Quadrant among the giants of the DBMS industry.